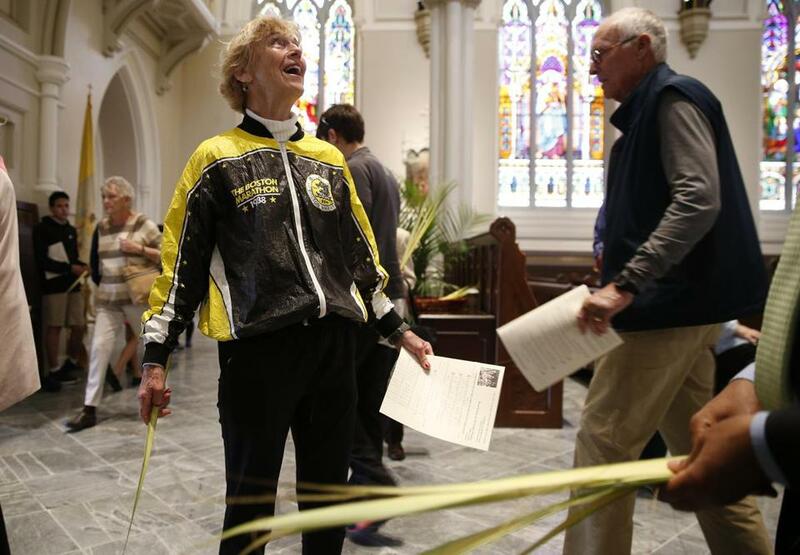 Betty Ryberg of Aiken, S.C. — in Boston to cheer on her daughter, a Marathon entrant — admired Holy Cross Cathedral on Sunday. Sunday was a time of traditions at the mother church of Boston’s Roman Catholic Archdiocese, but also of renewal. It was Palm Sunday, the solemn day commemorating Jesus’ entrance into Jerusalem and the beginning of Holy Week. Sunday also was the eve of the Boston Marathon and the day Cardinal Sean O’Malley traditionally blesses the runners. And it was a day many parishioners had awaited for two years, as O’Malley celebrated the first Mass inside the cathedral since a $26 million restoration was completed. The stately cathedral’s faded red carpet is gone, as are the steps into each pew that sometimes tripped congregants. New stone tiles that were handpicked by O’Malley gleam, and the aging pews have been refinished and fitted with new kneelers. 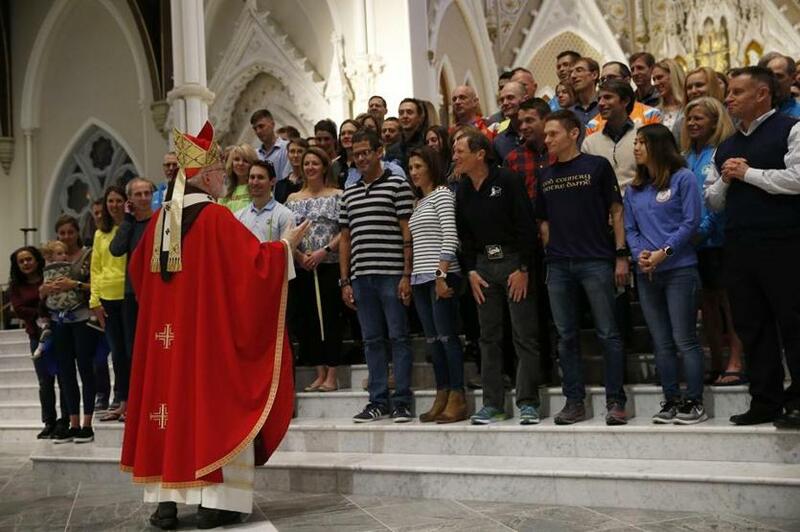 When more than 50 runners gathered at the altar for O’Malley’s blessing, they stood on steps of shining marble. 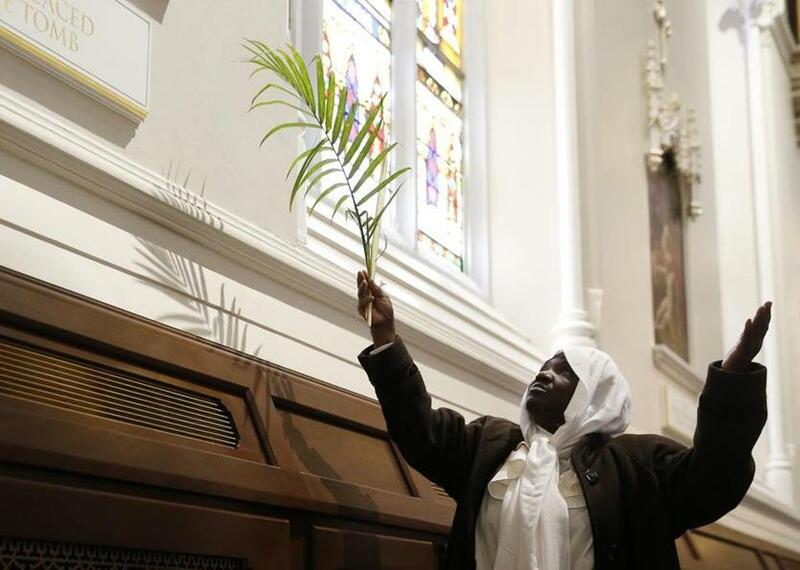 Darlene Price of Somerville held aloft her palm as she prayed during a Palm Sunday Mass at the newly reopened Holy Cross Cathedral. In his homily, O’Malley recalled the long history of the cathedral and the immigrants, mostly Irish fleeing the famine, who swelled Boston’s Catholic population in the 19th century, making the construction of the 2,000-capacity mother church necessary. About 40,000 people were present for the 1867 laying of its cornerstone, he said, and parishioners raised $1.5 million for its construction — the equivalent of about $30 million today, or just a little more than the cost of the recent privately funded restoration. Boston was then becoming an increasingly Catholic city. But in recent decades, amid a growing number of scandals over sexual abuse within the church and a wider trend away from organized religion, congregations have shrunk. The cathedral’s restoration, O’Malley said, sends a timely message about the possibilities of faith. Not every element of Sunday’s Mass went according to plan. As O’Malley drew near the end of his homily, incense from a Latin rite Mass downstairs set off a new smoke alarm, interrupting his reminder to the congregation of more than 1,000 that believers are called to witness their faith to others. Bobby Travers, 44, a pastoral associate, said he has traveled with the cardinal and heard talk of the cathedral’s old reputation in cities around the world. Cardinal O’Malley blessed runners in Monday’s Boston Marathon.